I've seen pictures of ceiling mounted hangboard / campus setups and I want to build something similar. 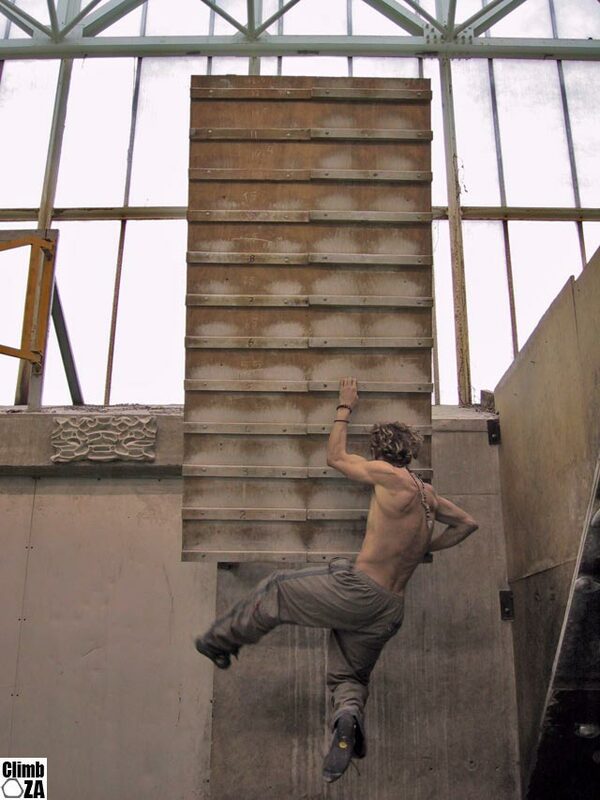 Right now the hangboard and rungs are on a 15 degree wall. I want to instead build the ceiling mounted short wall that comes down from the ceiling about 4 feet. Anyone have a scematic for it? What I'm looking for is something like the pic below, but mounted free in the center of the room. I'm pretty good with construction and can probably just put some sleepers in and then figure out how to mount a pre-built structure to it, but I have some concerns about it being free from a wall and still being sturdy enough for big guy campus fun. 1) pair of 4x4's running floor to ceiling. 2) tie in the joists and L bolt to the floor. 3) drop a couple 2x6's across for support. 4) build campus board and attach to bomb proof structure. it will certainly not look as cool, but its functional and easy. Those guys fiend for questions like this. I do have the treadwall that I could somehow use as a stabilizing base. My treadwall is modified to be fixed at 35 degrees, but I could potentially use the cross bar of the A frame to act the same as the wall would in a normal campus board. Like below. Thoughts? As an aside, my advice to anyone making a campus board is to avoid those tiny crimp rails that everyone plunks on there. It's an archaic design with little benefit and big potential to cause problems in finger joints. you don't need to crunch your finger bones together to get a good campus workout. It does make you look tre' badass, though, if that's your end-game. instead, use 4" PVC chopped in half length-wise, slide a 2x4 inside, screw it on and cover with grip tape. makes campus workouts 1000% more enjoyable, and trains for open-handed strength. There's a full-size campus board like that in Albuquerque, and it's fun as hell. I've stopped in that gym a few times just to use it. bcombs wrote: That's what I was afraid of. Is the treadwall bolted down? it would be embarrassing to die from being squashed in such a way. I do not think it would be possible for a few hundred pounds of wood and human to flip a treadwall on its side, if with the extra force of campusing on it. Wouldn't you think? Edit: Also, just to be clear, the campus board would be mounted to the ceiling. That is the two squares on top, 2/4's screwed to the ceiling joists. My treadwall is modified in a way where it is exactly the same height as the ceiling (more or less). So in my case, flipping it would also include tearing past 4 joists and all the drywall. Location: Like Prince my name has now changed..please call me Piglovely. why is that guy wearing climbing shoes in that picture? Hang it from the joists by some 2x6's with bolts that go through both the 2x6's and the joists. You may have to double up the joists fro a considerable span to prevent sagging. Build your 15 deg. campus board on one side. Then opposite the campus board, run some 2x6's from the bottom of your campus board (and consequently the vertical hanging 2x6's) back up to the joists at a 30 deg angle. This will make a triangle coming down from the ceiling (15 deg on the front, 30 deg on the back), preventing the board from moving at all back and forth. As long as your vertical 2x6's are mounted securely enough and the joists can handle the weight and movement, this will work. Of course you may need to run a few diagonals here and there within the structure to prevent it from swaying side to side, or, just sheet the 30 deg side as well for a two sided campus/training board.
" Gimme the bat Wendy... just, gimme the bat." Pig... You have to train with what you will climb in... Duh!